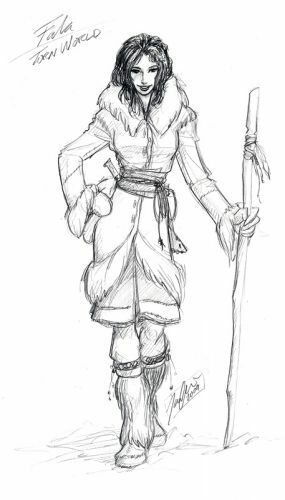 Fala is a ranger of the snow-unicorn riders. Fala the Leader (1500.06.08): Fala and her young agemates have an adventure while picking blackberries. Young Fala and her agemates meet a bear while picking blackberries. Northern children receive new privileges instead of new gifts, along with a special feast. Looking Up to Him (1501.07.01): Tiren returns to Itadesh and acquires an age-set's worth of hero worship. Anler wants to beat Inav at Rams and Ewes. He comes close, but Inav still wins. Though they stumble at first, the group pulls together to pass the first test. They discover Other-touched landslides baring the subsoil and stone. Then one of the Others surprises them and they must fight to destroy it. Upon returning to the village, Fala and Dareg argue that the Other did not behave much like an animal, although the Others had generally been considered animals (or at least animal-like). They discover that the Others have touched down on the mountain, starting landslides; and they wind up fighting one. Upon returning to Itrelir, they argue that the Others don't behave the way animals do. He introduces her to the Wander Tent, which is designed to be relaxing for rangers. They present Karavai with his furshirt. Leaves in a Bitter Wind (1520.06.04): Fala serves as a trail scout while traveling to and from Itadesh. This story shows how Fala deals with the aftermath of the fire that wipes out the village of Itadesh. She helps to explore the valley and then to guide the group heading to Itrelir for refuge. Although less devastated than some other people, Fala still finds the stress wearing on her during the journey. The Secret Scroll (1520.06.08): The ashes of Itadesh stir up old memories as Birka and Fala figure out what happened to the village. Travel, Transition, Transcription (1520.06.29): The Itadesh rangers discuss rebuilding the village. Riding From the Rescue (poem): Fala rides for help. Fala sets a grueling pace to fetch a healer to save a ranger's life.